This Die-namics coordinates with the Wildflowers stamp set for perfectly sized die cuts every time. It is open inside to allow you to stamp then cut OR cut then stamp. This feature makes the Die-namics lighter weight and allows for easier removal from the die. This 11 piece set includes: Seven-petal flower head (with Smart Align) 1 9/16" x 1 7/16", Six-petal flower head (with Smart Align) 1 13/16" x 1 5/8", Four-petal flower with stem 1 3/8" x 3 1/4", Seven-petal flower with stem 1 7/16" x 2 7/8", Eight-petal flower with stem 1 1/2" x 3", Berry sprig 1 1/8" x 3 1/4", Multi-leaf foliage 1 1/8" x 2 1/2", Three-leaf foliage 7/8" x 2 1/2", Single leaves (3) 1/2" x 1 3/16", 5/8" x 1 1/8", 5/8" x 1 1/4". Craft dies from Altenew featuring flowers. There are a total of 11 dies in this set. The largest flower measures about 2" x 1.7" while the leafy branches measures about 2" x 0.3 - 0.8". Express Yourself MIP-3D Stickers. Personalize your cards, gift tags, invitations, scrapbooks and more with these fun stickers! This 3-1/2x3 inch package contains 3 Yellow Flowers: three 3D stickers Imported. A traditional style hibiscus and tropical leaf. The flower will cut as 2 pieces (petals, and stamen). The flower measures 1.6" x 1.4", and the large tropical leaf is 1.3" x 0.875". Frantic Stamper Precision Dies are made in the USA and will work with most leading table-top consumer die cutting machines. This Die-namics coordinates with the Beautiful Bloom stamp set for perfectly sized die cuts every time. It is open inside to allow you to stamp then cut OR cut then stamp. This feature makes the Die-namics lighter weight and allows for easier removal from the die. Our Smart Align technology makes lining up the stamp image and coordinating Die-namics a breeze. Approx size: 1.25" wide x 2.75" tall. This is a stylized silhouette of a Black-eyed Susan bloom. This die set coordinates with our Blissful Bud stamp set (ALT1685). There are a total of 3 dies in this set. Artist Laurel Burch strove to create images that would remind people of the ongoing world of the spirit. Magical, beautiful images that will give you the freedom of expression to color and enjoy. Woman die measures approximately 4" X 4.5". 5 pieces designed to coordinate perfectly with Blossoming Woman Cling Rubber Stamp Set. 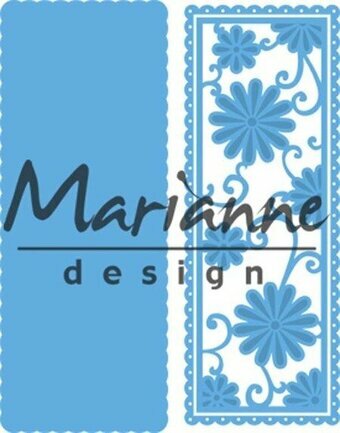 Cheery Lynn Designs die featuring flowers and leaves. Pieces: 4. Approximate Size: Flower 1: 2.6" x 2.6" (66mm x 66mm), Flower 2: 2.75" x 2.5" (70mm x 65mm), Leaf 1: 1.2" x 2.25" (30mm x 57mm), Leaf 2: 0.9" x 1.8" (22mm x 47mm). Made in America. Delicate cherry blossoms can be colored as any flower in this great background. Stencil measures approximately 3 1/2″ x 4 1/2″. Craft dies featuring flowers. These high quality, stainless steel, wafer thin, cutting dies are intended for use with most major die cutting machines. 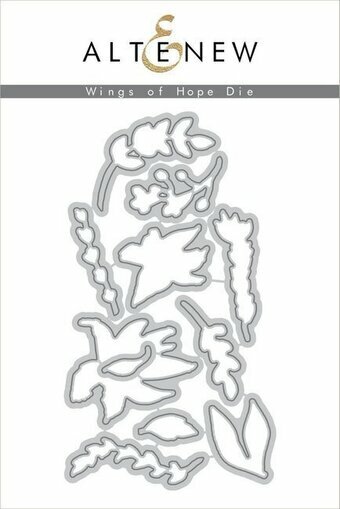 Stamp and die set featuring a bird with flowers. This coordinating set includes dies and stamps. Stamp first and then cut out using the matching die and a die-cutting machine. Create a variety of projects from cards, gift tags and more. Dies are compatible with most brands of die-cutting machines. Adapters and shims may be required on some machines. Made in the USA and 100% lead-free. Craft die featuring Christmas flowers. CottageCutz are thin metal dies, like a QuicKutz. They are easy-to-use and add great detail to any craft project. They are compatible with most brands of die-cutting machines. Adapters and shims may be required on some machines. Use with paper, cardstock, vinyl, vellum, adhesive-back paper and more. Made in the USA and 100% lead-free. Craft die featuring Dogwood flowers. All of the CottageCutz metal dies are universal, easy to use and add great detail to any craft project. They are compatible with most brands of die-cutting machines. Adapters and shims may be required on some machines. Use with paper, cardstock, vinyl, vellum, adhesive-back paper and more. Made in the USA and 100% lead-free. Craft die featuring a wreath with flowers. CottageCutz are thin metal dies, like a QuicKutz. They are easy-to-use and add great detail to any craft project. They are compatible with most brands of die-cutting machines. Adapters and shims may be required on some machines. Use with paper, cardstock, vinyl, vellum, adhesive-back paper and more. Made in the USA and 100% lead-free. Craft die featuring Spring Bunny Rabbit With Flowers. All of the CottageCutz metal dies are universal, easy to use and add great detail to any craft project. They are compatible with most brands of die-cutting machines. Adapters and shims may be required on some machines. Use with paper, cardstock, vinyl, vellum, adhesive-back paper and more. These dies have an easy release coating along with pin holes that aid in the removal of the material being cut. Made in the USA and 100% lead-free. Craft die featuring a Spring Watering Can with flowers. CottageCutz are thin metal dies, like a QuicKutz. They are easy-to-use and add great detail to any craft project. They are compatible with most brands of die-cutting machines. Adapters and shims may be required on some machines. Use with paper, cardstock, vinyl, vellum, adhesive-back paper and more. Made in the USA and 100% lead-free. 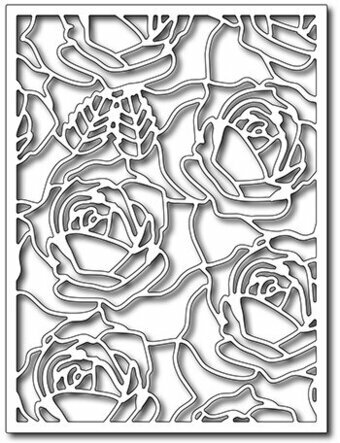 This stencil shows roses in a simple swirl pattern in various sizes. Includes 1 stencil. Size: 6 x 6 inches. Inspired by Denise Boddey and filled with subtle, spiritual and natural themes, this beautiful die set from the Bohemian Bouquet Collection is perfect for creating stunning elements on your next card, scrapbook page or off the page project! This package contains one 1.4x2.3 inch die. Craft die featuring a trio of flowers. These brand new Classiques dies from the Die'sire family are great for creating detailed corners with an elegant touch. Easy-to-use and beautifully detailed, these thin metal dies are perfect for not only corner detailing but also for pretty borders, delicate detailing and so much more. There are two dies in each pack meaning you can get more out of each design. Each die measures 2.2" x 2.2", so is a handy size for smaller projects as well as larger ones.